Let’s turn the clock back to some of the biggest games this past week in the 2015-2016 PBA Philippine Cup. Rain or Shinr and Alaska, both of whom were still in contention for outright semis berths, got big wins, while Talk N Text and Star gathered great momentum with separate victories. The Rain or Shine Elasto Painters drew closer to clinching one of the top two spots in the SMART BRO PBA Philippine Cup elimination round after defeating the struggling Meralco Bolts, 97-87, on Wednesday at the SMART-Araneta Coliseum. Jeff Chan scored 24 points while Raymond Almazan had a big night with 21 points and 17 rebounds to lead Rain or Shine, which moved to 8-2 for the conference. Jericho Cruz chipped in with 13 points in the game. The Elasto Painters remain ahead of the Alaska Aces (7-2) for No. 2 while holding the tiebreaker due to the winner over the other rule. They finish their schedule against the Mahindra Enforcers while Alaska still has to play the defending champion and league-leader San Miguel Beermen. Meralco wrapped up their elimination round campaign with a 1-10 record. 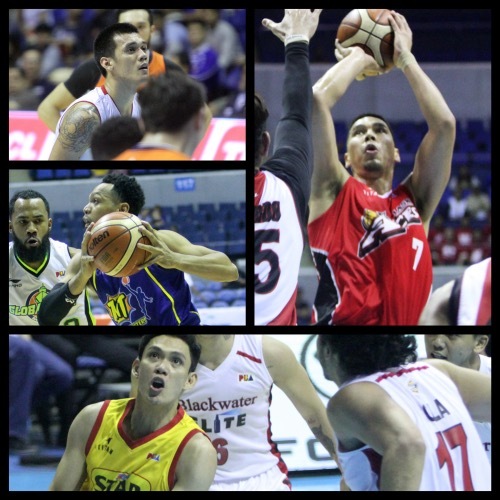 Jared Dillinger led the Bolts with 15 points while rookies Baser Amer and Chris Newsome scored 13 and 12 respectively. Jimmy Alapag had 10 points and four assists in the loss. The gutsy Alaska Aces took on the league’s giants, the San Miguel Beermen, and stood tall in the end, 103-97, to remain in the hunt for a top-two finish in the SMART BRO PBA Philippine Cup’s elimination round on Wednesday at the SMART-Araneta Coliseum. The Aces needed to survive a phenomenal performance from reigning back-to-back PBA MVP June Mar Fajardo, who finished with a career-best 43 points and 20 rebounds, but somehow got the job done. Alaska put an end to San Miguel’s seven-game winning streak and handed the defending champions, who have been at No. 1 for most of the conference, just their second loss in 11 games this conference. With the win, the Aces kept pace with the Rain or Shine Elasto Painters at 8-2, with both having the chance to force a tie with the Beermen if they can hurdle their respective final assignments. Sonny Thoss scored 18 points, Calvin Abueva added a double-double with 17 points, 11 rebounds and five assists while Chris Banchero chipped in with 17 of his own to lead Alaska. Alaska had five players finishing in double figures in scoring. Manuel finished with 12 points and Baguio had 10. RJ Jazul nearly made the cut with nine markers. SMB’s Alex Cabagnot scored 19 points to support Fajardo’s career-high total. Santos finished with 10 points but shot just 4-for-14 (28%) from the field. The Talk ‘N Text Tropang Texters boosted their chances of finishing in the top six after pounding GlobalPort, 107-96, in the SMART BRO PBA Philippine Cup on Friday at the SMART-Araneta Coliseum. TNT rode the momentum of a huge 38-point second quarter to cruise to a victory in which they led by as many as 19 points. Jayson Castro scored 25 points and dished out six assists to lead the Tropang Texters while rookie Troy Rosario, the No. 2 pick of the 2015 PBA Draft, had another strong showing, finishing with 19 points, including three triples, alongside seven rebounds and three assists. Harvey Carey posted 9 points and a team-high 12 rebounds while Larry Fonacier, Danny Seigle and Aaron Aban all added nine markers to make up for the absence of starting center Moala Tautuaa, the top pick of the draft. TNT strengthened its bid to finish in the top six and clinch the twice-to-beat advantage for the quarterfinal round. They tied Barangay Ginebra for fifth place in the standings at 6 wins and 4 losses apiece and also inched closer to the Batang Pier (7-4), who remained in fourth place despite the loss. GlobalPort was led by backcourt star Stanley Pringle and Terrence Romeo, who each scored 24 points. The pair combined for 11 three-pointers in the game with Pringle shooting 6-for-10 (60%) and Romeo going 5-for-8 (62%) from long range. The Star Hotshots assured themselves a seat in the SMART BRO PBA Philippine Cup playoffs after defeating Blackwater, 102-89, in a crucial encounter on Friday at the SMART Araneta Coliseum. Star, which had last season’s expansion teams Blackwater and Mahindra breathing down its neck in the standings, secured its place in the quarterfinal round with the win over the Elite. Star closed out their elimination round schedule at 4-7, while Blackwater dropped down into a tie with Mahindra at 2-8. Peter June Simon scored 26 big points to bounce back from a scoreless performance in his last game. He shot 8-for-14 (57%) from the field and made five three-pointers in the win. Four other Hotshots scored in double figures. Allein Maliksi posted 13 points, Marc Pingris finished with 12 and Alex Mallari and Mark Barroca both had 11. Young guns Carlo Lastimosa and Arthur Dela Cruz paced Blackwater with 18 and 17 points respectively.